Not many of our career highlights can hold a candle to what Meghan Klingenberg says is her proudest moment. For the American soccer defender, it occurred minutes after winning the World Cup in 2015, holding the American flag with teammate Becky Sauerbrunn, waving to family and friends and fans. 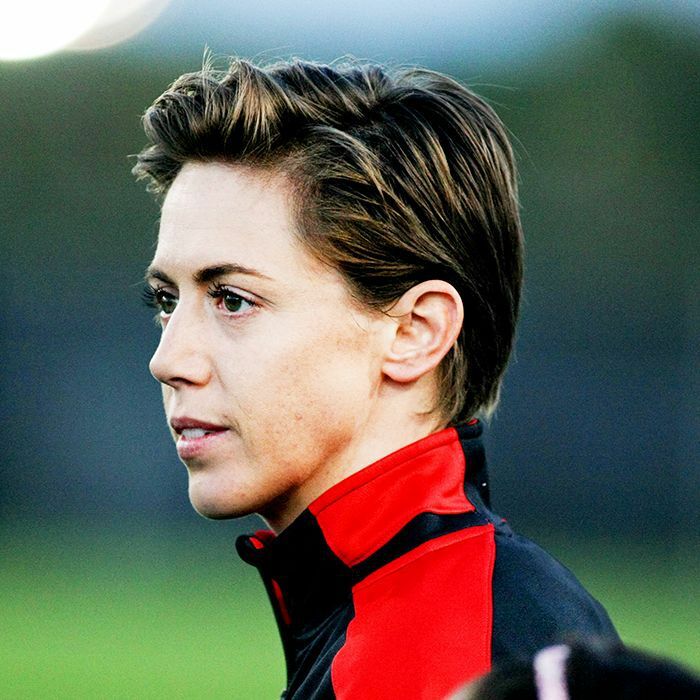 In addition to being a World Cup champion with the United States women's national soccer team, Klingenberg plays for the Portland Thorns in the National Women's Soccer League. We caught up with the soccer star to see how she stays fueled for her demanding workouts and busy schedule as well as how she takes care of herself when she's not on the field. You can catch Meghan and the National Women’s Soccer League on Lifetime Saturdays at 3 p.m. EDT, but in the meantime, you can see her take on health and wellness here. Head below to see how Meghan Klingenberg stays fueled on a vegan diet and learn about her "100 plan." Klingenberg says what she eats to stay fueled is a little bit different every day depending on what she needs. "On game day, I eat a lot different than the days after the game. On game days, I make sure I eat so many calories. There's no way I should be depleted out on the field." Klingenberg makes sure her game-day diet includes plenty of protein, electrolytes, and iron. Before a big game, she avoids spicy foods and "anything that will make you burp" or anything that can distract you from the game. "Everybody knows their certain foods," she explains. For Klingenberg, that means beans and sparkling water. "I transitioned to a vegan lifestyle a year and a half ago," says Klingenberg who recounted that when she first made the switch it was a little difficult. "I grew up Italian, so I love to make sauces and soups," she says of her initial worry that she wouldn't be able to enjoy some of her favorite foods. But Klingenberg soon found that it was still possible to cook what you love "once you get the hang of it, once you know what kind of milks work well with different foods—curries with coconut milk, lattes with hemp milk." She notes that a common misconception is how much protein an athlete needs to stay strong and perform at their best. "I've never felt fitter; I've never felt stronger," Klingenberg admits. "I've actually lifted more in the weight room." Klingenberg is a regular cook and baker. "It's one of my favorite things to do because I love food so much," she admits. She often posts videos on her Instagram account. "I think it's cool to share the things that I eat as an athlete—things that I do to prepare my body for the week." It's also a way to show fans and followers how she cooks with vegan products. She confesses there are always some things she makes that are a bit less healthy and a bit more fun such as doughnuts, biscuits, and gravy that she rewards herself once a week after a game. One of her favorite treats is cookie dough balls made with raw cashews, almond butter, coconut, oats, chocolate chips, honey, vanilla extract, salt, and dates. "I eat them after practice for a good recovery snack," she says. "I'm on this 100 plan," confessed Klingenberg when asked how her diet had changed over the course of her career. "I want to live a healthy, happy life until I'm 100 years old." Her strategy goes beyond her vegan diet, opting for all-natural ingredients in various aspects of her life. "That means I'm putting the right things into my body but also using the right things," she explains, listing shampoos that have basic ingredients, essential oils instead of medicine, tea tree oil as face wash, and all-natural cleaners. She always wears lavender essential oil as her perfume and swears by Schmidt's deodorant—which she's even turned her teammates onto. "I think the really important part of wellness is your mental well-being too," notes Klingenberg who does yoga after games and says it helps to ground her. She also practices meditation to work on her breathing and focus on "just being, as opposed to all these other things." In her free time, Klingenberg also loves to hike. "Especially in Portland—we're blessed with beautiful and different landscapes." Next up, check out the beauty routine of a WNBA champion.